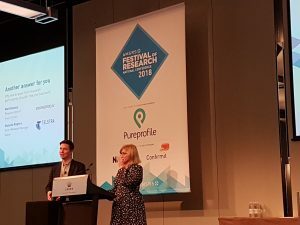 Last week I had the honour to attend the Australian AMSRS Annual Conference in Melbourne, and once again it was a great event, leaving my head full of new ideas, and my batteries re-charged with a love for market research and insights. 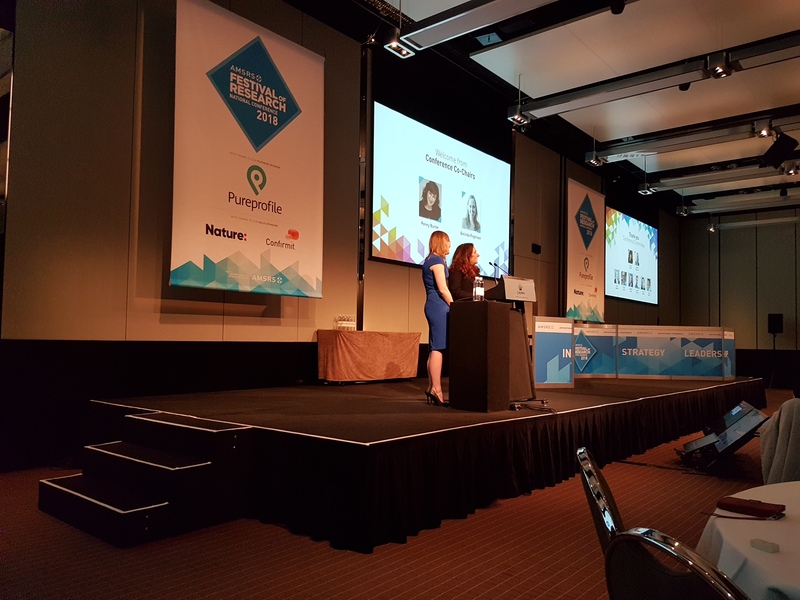 The people, starting with Leslea Clements and Elissa Molloy, extending to the wider AMSRS team (staff, board members, volunteers etc), and the programme committee. 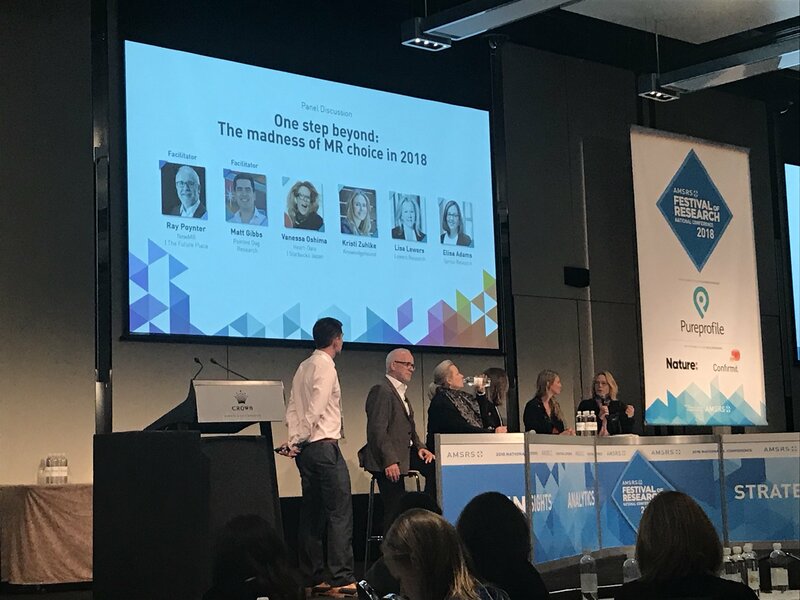 The excitement of the new, in particular the way the invited speakers made a point of pushing the boundaries of what we mean by market research and asking questions about where next? The best of the old, AMSRS makes plenty of space available in its programme for social research, methodology papers, case studies, and initiatives such as the better surveys project – ensuring that the core skills and assets of market research are retained and enhanced. The social side, AMSRS dinners are legendary, blending a great chance to meet people and simple, unadulterated fun. 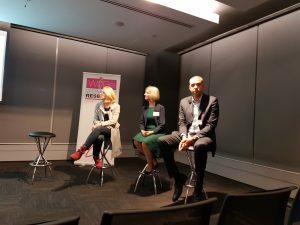 WIRE – Women in Research. On the evening before the conference proper WIRE organised an event chaired by Erica van Lieven and hosted by EY Sweeney. Erica and a panel that included EY Sweeney’s Jason Whatley along with overseas contributors Vanessa Oshima and Fiona Blades tackled a range of issues relating to diversity – including neuro-diversity. This session got people thinking about several key issues and was a great opener for the conference. Non-MR keynote speakers. 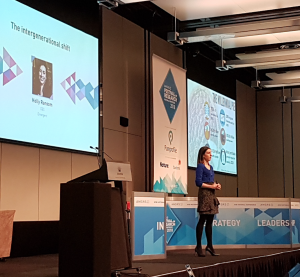 Key contributions came from Stephen Scheeler (ex-Managing Director of Facebook Australia and New Zealand), Chris Riddell (futurist) and Holly Ransom (CEO of Emergent). There was some overlap in the material from all three of these speakers (especially Stephen and Chris), but that helped reinforce the power of their message that the world is changing and that research needs to change, adapt, and evolve with it. Holly Ransom was one of the younger presenters at the conference (she is under 30), and one of the most successful (a great combination). One fascinating insight was that when she started to make waves Rotary Club had the good sense to get her involved. Just like the Rotary Club, market research companies need to fast-track new and exciting talent. Doing research better. There were several sessions on doing research better (covering methodology, case study, and initiatives to improve market research). 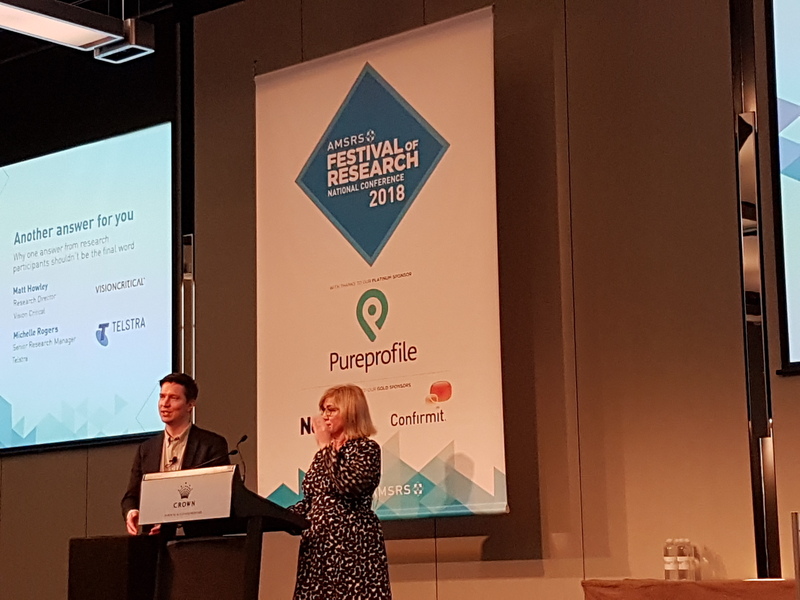 For example from Sara Dolnicar reported on the better surveys initiative, Darren Pennay and Stephen Prendergast looked at how to improve non-probability panels, and NewMR’s Sue York (who is also chair of AMSRS’s Professional Development Committee) looked at the state of training Australia and contrasted that with the global picture. I was particularly interested in Matt Howley and Michelle Rogers investigation of what is happening to customers and NPS by looking at the data in a longitudinal way. What does 80% right mean? One of the most interesting debates initiated by the Conference started at the event, but then took off on Social Media. 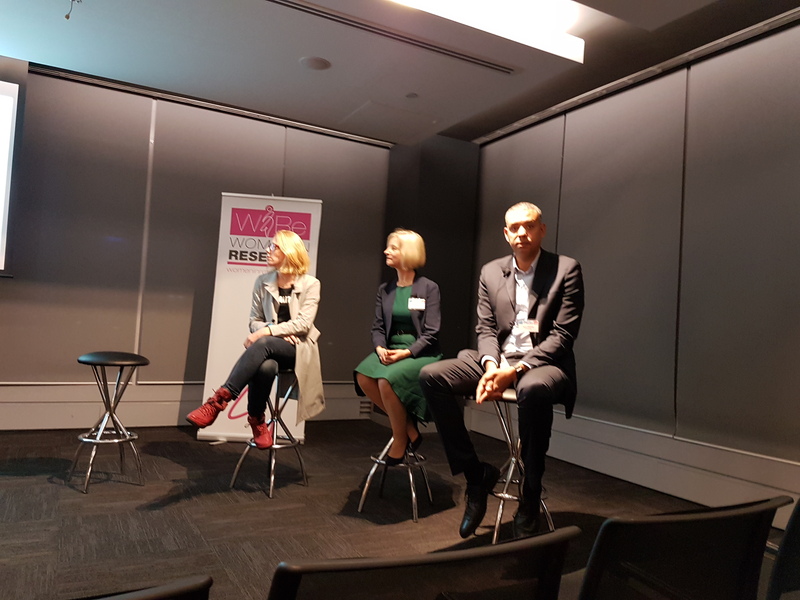 In one of the panel sessions Vision Critical’s APAC CEO Peter Harris talked about the need to strive for more accuracy. 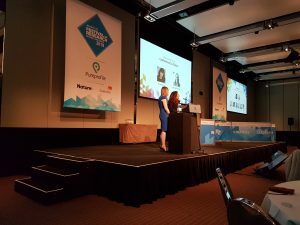 I was on the panel at that stage and responded that the thrust of what clients had been saying (including the two on that panel) was that usability/speed were the key issue, not more accuracy. Peter quickly conceded that yes, quite often, clients will ask for research to be 80% right and fast, rather than delaying things in the hope of being 100% right (but late). The buyer of a B2B service sets the standard they want to buy, not the vendor. Vendor’s can advise, they might refuse to sell a truly inadequate product, but the buyer decides. In market research almost nothing is ‘100% correct’ – it is a false goal. 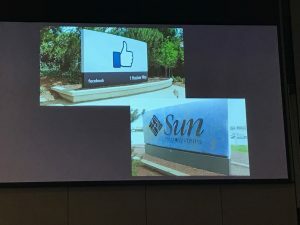 The nature of the inputs we have, the endogenous nature of humans researching humans, and the use of probabilistic techniques mean that ‘right’ is not a ‘thing’. The key role for market research is to allow businesses to make better decisions. This means terms like useful or ‘fit for purpose’ are the relevant benchmarks. The buyer should be aware of how much accuracy they are buying and be able to assess the value for money of that purchase. Both Stephen Scheeler and Chris Riddell used this same image. When Facebook moved into the old Sun Microsystems campus they just turned the sign round, to remind themselves that the mighty can crumble. Although there is no such thing as ‘right’ there are plenty of things that are ‘wrong’ (one of which is giving a false sense of confidence). Although many clients are saying they are happy to be ‘80% right’ – we do not actually have a clear idea of what this means. The definition of 80% right will clearly differ from situation to situation. Market research as an industry needs to do some thinking about the range of things 80% right could mean, and ensure that when a client asks for 80%, they get the sort of thing they had envisaged.